This is the first time a synchronized skating qualifying event has ever taken place in Wichita. The teams who place in the top four at the sectionals competition will go on to the championships in Portland, OR and eventually, Worlds. More than 2,500 athletes representing 160 teams will battle it out on the ice showing off their skills through their unique choreographed routines. This event is expected to generate more than $3.4 million in local economic impact. 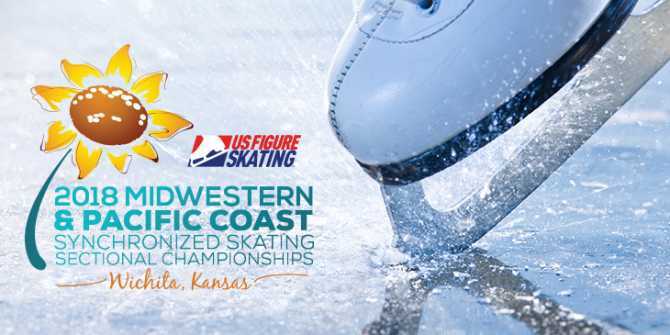 Visit Wichita, the Greater Wichita Sports Commission and the Wichita Figure Skating Club are proud to welcome the athletes, families, friends and fans of US Figure Skating to our great city. The competition will take place at INTRUST Bank Arena from Jan. 24-28, with practices at Wichita Ice Center. Click here for a list of things to do between competitions. The sport started about 50 years ago, but has only had a national championship event since 1984. As a form of figure skating, synchronized skating is a spectator sport that involves 8-20 skaters performing a routine including several elements, in unison. From circles, wheels, lines and intersections to move elements, creative elements, spins and pair moves, skaters take to the ice for up to four minutes at a time to perform their choreographed routines. There are more than 550 synchronized skating teams registered with US Figure Skating and more than 5,000 athletes who compete annually for their chance to head to the ISU World Synchronized Skating Championships, happening in Sweden this year. Masters – 12-20 skaters at least 25 years old with the majority being over age 30. While you’re downtown either participating or enjoying the 2018 Midwestern and Pacific Coast Synchronized Skating Sectional Championships, be sure to check out the great shopping and dining options in downtown Wichita. You can also check out our calendar of events for a look at what else is happening between competitions.